I am suddenly militant, at age 58, at the state of women in the world. I am just becoming fully aware that women in THE YEAR 2011 remain UNDERSERVED, UNDERREPRESENTED, and UNDERPAID. This is absurd. Irritating. Enraging. Women remain largely absent from the upper echelons of power, even in professions where their numbers dominate. I thought we had pretty much arrived; we haven't. My budding consciousness burst into full bloom this Spring, at the Simmons Leadership Conference widely recognized as the world's premiere conference for women. 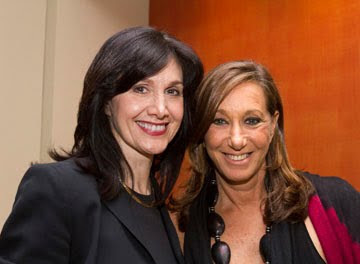 I found myself hanging out with Donna Karan-- world famous fashion designer and philanthropist who, in addition to running her worldwide fashion empire (half my closet is Donna Karan), is working on everything from pediatric aids, to ovarian cancer research, to an Urban Zen initiative now focused on Haiti to enhance wellness, preserve culture, and empower children. Donna is among the female powerful elite; she has a personality as magically enveloping as her clothes and was instantly accessible to the throngs who approached her after her closing address. She felt like my long lost girlfriend; I wanted to have her over for a pajama party and wear her clothes to bed. She assures me she's actually done this. Then there was Judith Jamison, the awe-inspiring Alvin Ailey dancer, muse, choreographer, and now retiring artistic director of that world-renowned company-- which alas is not coming to Boston this year for the first time in 39 years. She lifted us all up, past her sky- high frame and flew us around the auditorium on her soaring spirit. A powerhouse of positive energy, Judith mesmerized the crowd with tales of her extraordinarily loving family, a formidable work ethic, and a talent for molding a company of highly-trained, dynamic individuals into a cohesive artistic unit: the extraordinary Alvin Ailey dancers who thrill audiences with their vitality and beauty. We hugged; I felt sanctified. Finally I was lucky enough to interview Pat Mitchell the president and CEO of the Paley Center for Media, and previously the first woman president and CEO of PBS. Before that Pat was president of CNN. Pat also occupied the slot I did at WBZ-TV from 1971-77; she too majored in English Lit and taught same. Then, our two roads diverged -- and Pat took the one less traveled by women. We had not met until 20 minutes before her eloquent and shocking remarks on the state of women in media. After her remarks I interviewed her onstage before a rapt audience, then claimed her as my mentor. She has very kindly obliged. I am thinking back to being a college student at Simmons in the '70's and hearing about "Women's Lib" for the first time and thinking, "Why do we need that? I can do anything I want already. Can't any woman?" I eventually discovered that not all women had working mothers and grandmothers to inspire them as I did, or fathers who were proud of same mothers. I never thought that in 2011 there would be such a disparity in power. Many women around the world remain prisoners in their own homes and homelands. Some women are forbidden to read, to even be seen; some are bartered like so many goods. It's seems clear that the barometer of a culture is the status of its women. Yes. We have not arrived. I am recalibrating my itinerary and will keep you posted along the way. Small forces can make great change in direction over time. THEATRE DOUBLE BILL: "DROWSY" & "PANSY"!! LOVE LOVE LOVE "THE NORTIES"! !